Some dogs are food obsessed. No matter how well fed they are, they’re never far from the family dinner table at mealtimes, hoping for scraps or leftovers. But that whining, pawing and pacing can get annoying, so use our tips to reduce mealtime begging. There’s only one reason your dog begs every mealtime – because it’s worked in the past! By slipping your pooch scraps from the table, you’ve taught him or her that puppy dog eyes, pawing and barking are a great way to get what they want. The most effective way to stop begging is to go cold turkey. Ignore the behaviours completely. Don’t reward with attention and make sure the whole family are being consistent, no sneaking scraps under the table or Fido will never learn! There’s no overnight fix but over time your pooch should learn that begging brings no rewards and the behaviour should reduce and stop. Your dog does not need scraps. They are not starving. You should know, you feed them! Those puppy dog “I’m-starving-please-take-pity-on-me” eyes can be almost impossible to resist but stay strong! Dogs don’t need their food supplemented by human foods and in fact, many of the things we eat can be harmful to our pooches. Best way to avoid that is to stop feeding scraps all together! 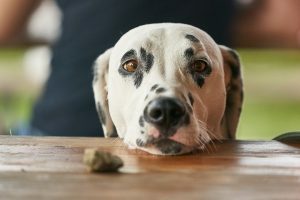 Giving your doggo somewhere else to direct his attention during mealtimes can help to reduce the unwanted begging behaviour. Set up a puzzle or game to keep your pooch busy and enjoy a whine-free meal! We’ve suggested some great puzzle games available in shops or DIY versions you can make with bits and bobs lying around the house. Whatever your preference, give your dog some mental stimulation to keep him or her busy and away from the table at dinner time! Does your dog have an annoying habit you’d like to break? Let us know below and we could write an article on it!